Some people have the gift of comedic timing. Others don't. If you're a politician, you should recognize your strengths. Bill Clinton? He can tell a joke. Hell, even George W. Bush could get in a few zingers. But two-time presidential candidate Mitt Romney is off the campaign trail and telling Obama jokes. Let's just say that he would probably be better off running for president a third time than becoming a comedian. While stumping for Iowa Senate Republican candidate Joni Ernst, Romney thought he would make a foray into comedy with a joke that he got "on the Internet from a family member" i.e. a chain email joke that I also likely received from my grandfather. "Now when you're running for office people tell you, you shouldn't tell jokes," Romney said. "But I'm not running for office, so I can tell one." President Obama went to the bank to cash a check and he didn't have his ID. And the teller said you've got to prove who you are. He said, "How should I do that?" She said the other day Phil Mickelson came in, he didn't have his ID but he set up a little cup on the ground, took a golf ball, putted it right into that cup so they knew it was Phil Mickelson. They cashed his check. And then Andre Agassi came in. And Andre Agassi didn't have his ID either. He put a little target on the wall, took a tennis ball and racquet– hit it onto that target time. We knew that was Andre Agassi so we cashed his check. And she said to him, "Is there anything you can do to prove who you are?" And [Obama] said, "I don't have a clue." And she said, "Well, Mr. President, do you want your money in small bills or large bills. 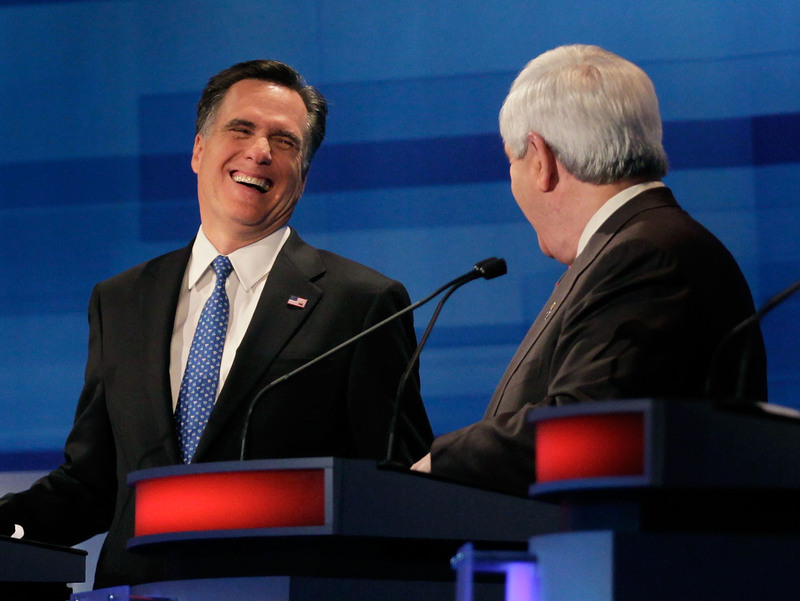 It is yet unconfirmed if Romney then uproariously laughed at his own joke, then nervously accosted the audience asking if they "got it." We'll update with further information as it comes in. It seems a little bit of a stretch for Romney to insult the president with such a cheap (read: bad) joke. If you're going to waste a whole minute on humor, at least make it good humor. Obama isn't Romney's to beat anymore, so him dwelling on his former opponent makes him seem a little washed up. You've got to do a little bit better than "har har har you're incompetent" when making jabs at the guy who beat you. Well, there is a gem of good news in all of this: Romney brushed aside any thoughts of 2016 when he said he wasn't running! Hey, maybe Jeb Bush or Herman Cain can deliver a punchline better than ol' Mitt.